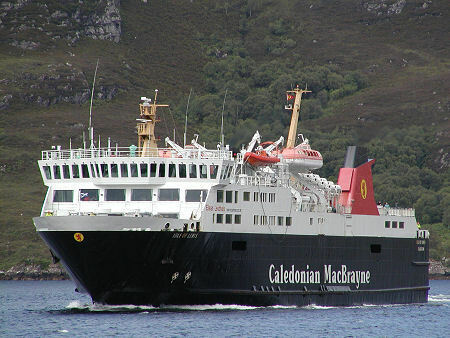 In 2014 a new ferry, MV Loch Seaforth, took over this route. We will update this page when we have travelled on it. 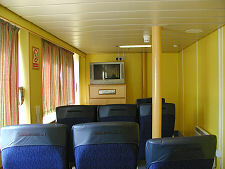 With the exception of one photograph of the new ferry, the rest of this page remains as written before this change took place. 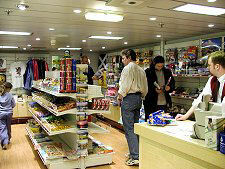 The main route to the north end of the Western Isles is via the car ferry that links Ullapool to Stornoway. Sunday observance is strong on Lewis, but since July 2009 the ferry has operated seven days a week. 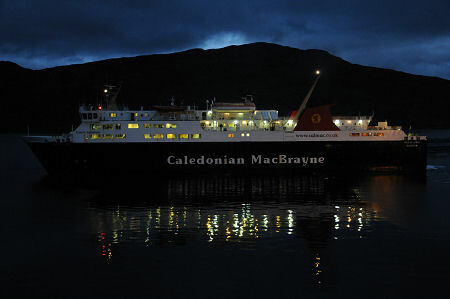 For current timetable and fare information, and for bookings, visit CalMac's website. The ferry used on the route is the Isle of Lewis. 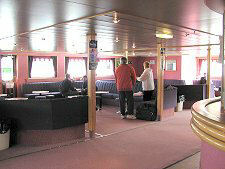 This is the largest ship in the CalMac fleet and it was built on the Clyde in 1995. The Isle of Lewis is capable of carrying up to 970 passengers and 123 cars. 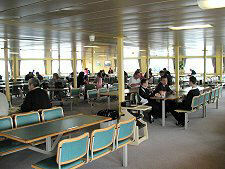 The interior is well appointed and spacious, with a large cafeteria and an observation lounge that comes complete with a display screen showing the ship's position. 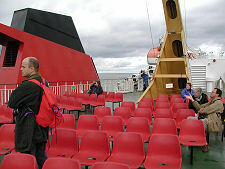 The Isle of Lewis is especially well served by deck areas available to passengers. This includes a large rear deck complete with a considerable number of seats. Although much of the route crosses The Minch, the deck areas afford really excellent views of Lewis at one end of the crossing and the North West Highlands at the other. The sheer amount of space on the Isle of Lewis, combined with the comfort of its internal accommodation and the amount of deck space open to passengers, makes it by far the most comfortable ship in the CalMac fleet as well as the largest. To go with the excellent ship is a modern CalMac ticket office on the pier at Ullapool and its strikingly-designed counterpart in Stornoway. The route from Ullapool involves excellent views of the town as you depart, sailing round Ullapool Point and heading towards the mouth of Loch Broom. Ullapool is a planned town built around two sides of a point projecting into Loch Broom: and in many ways the views of it from the Isle of Lewis are the best available from any viewpoint. The ship then makes its way past the Summer Isles, offering occasional views to the north towards Achiltibuie and the rest of the Coigach peninsula. But it is the mountains that really grab your attention. Most distinctive is the spiky little peak of Stac Polliadh, to the north, and if visibility is good you can also catch glimpses of Suilven, still further north. To the south the landscape is dominated by the peaks of An Teallach. 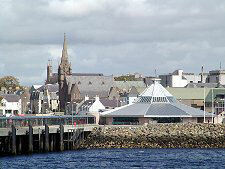 Arriving in Lewis you pass to the south of the Eye Peninsula before making your way into Stornoway Harbour. The views from the front of the observation lounge as you enter the harbour are some of the best you are likely to get of Stornoway itself. Shipping links between Ullapool and Stornoway date back at least to the 1870s when a paddle steamer called Ondine operated on the route. In 1881 the route was taken over by one of CalMac's predecessor companies and in 1885 the Ullapool terminus was switched to Strome Ferry. At the time this was the railhead on the line from Inverness which later reached Kyle of Lochalsh. For much of the next hundred years the steamers from Stornoway sailed to Kyle of Lochalsh and Mallaig. 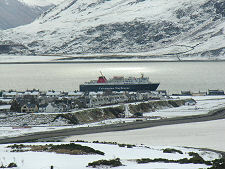 It was only the arrival of roll-on roll-off ferries in 1973 that led to the switch back to the shorter crossing to Ullapool.